Today, we’re celebrating the two year anniversary of “Know Before You Owe: student loans” — a project to help students better understand their loan options. We launched the Know Before You Owe: student loans project in 2011, in partnership with the Department of Education. One of the main features of the project is a financial aid shopping sheet which colleges and universities can use to help students better understand the type and amount of grants and loans they qualify for. 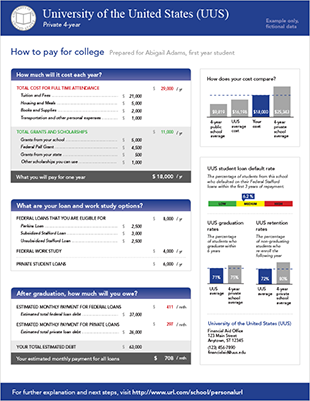 The shopping sheet also helps students easily compare aid packages offered by different institutions. Since 2011, more than 1,800 colleges have voluntarily adopted the financial aid shopping sheet, helping millions of students and their families. Soon after, we built a beta version of the compare financial aid and college cost tool. The tool, which complements the shopping sheet, works to help students make cost comparisons tailored to their individual circumstances. Students who received their financial aid offers could use the tool to see how college costs could impact their loan payments down the road. Today, students and families can upload the electronic version of their shopping sheet and make adjustments to their budget to see how it impacts their estimated student debt and monthly payments after graduation. After reviewing our memo and reading feedback from the public, the Department of Education unveiled the final shopping sheet . The final version reflects many of the suggestions consumers gave in response to the prototype. Just four months after the final product was released, Secretary of Education Arne Duncan announced that 500 colleges and universities would be using the shopping sheet for the upcoming school year. Today, more than 1,800 schools have adopted it . While a large number of colleges have chosen to adopt the shopping sheet, not all have, and many of you have asked us why certain schools haven’t. Consumer information helps us to shop and make good choices. For example, you can often learn about fuel efficiency when shopping for a car or learn about nutrition information when at the supermarket. This information helps us make apples-to-apples comparisons. Since the shopping sheet is voluntary, some colleges may want to hide the fact that their students leave with loads of debt. A clear comparison might lead to fewer students choosing these schools. Some colleges who haven’t adopted the shopping sheet may be less concerned about the student debt burdens of their graduates, compared to other colleges. If your college doesn’t use the shopping sheet, you may want to ask them why. 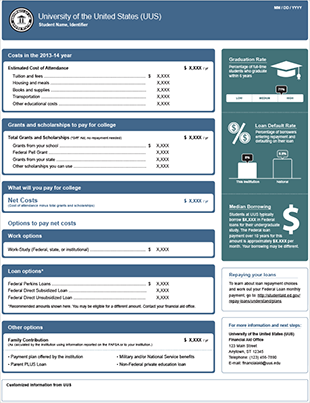 To research schools, compare financial aid, and figure out which loans to take, check out our Paying for College tool. Good luck! To learn more about student loans, check out Ask CFPB. You can also check out reports and other information on our work for students by visiting consumerfinance.gov/students.